Assemble the quarter panel side brackets to the side sockets on the car, using a spring washer under the head of each bolt. Tighten the single bolt securing each bracket and remove the hardtop securing bolts, complete with their four washers; keep these ready to hand. With one person at each side, lift the hardtop into position over the rear of the car. Lower the rear end of the hardtop and engage the anchor plate brackets with the car anchor plates. Difficulty will be met if the rear sealing rubber is not clear of the anchor-plate brackets. Centralize the hardtop by lining up the hardtop drip moulding with the rear wing top beading. Apply hand pressure evenly to the rear of the hardtop and check the front toggle fastener tongues are in their sockets with the front sealing rubber forward of the windscreen top. In this position, with pressure still applied from the rear, insert the quarter panel side bracket bolts, one each side, with one washer under the head of the bolt and the other three between the bracket on the hardtop and the bracket on the side of the car. Do not tighten the bolts down fully at this stage. Centralize the hardtop on to the windscreen and ensure that the front sealing rubber fits down snugly and evenly. With the hardtop pushed forward as far as possible, adjust the front toggle links to give an adequate tension to the over-centre action; this is achieved by trial. Tighten the bolts securing the toggles to the hardtop. Fasten the toggle links and apply the safety catches. Loosen the hardtop side securing bolts and check that the quarter panel securing rubber is correctly positioned to pull down onto the car body. Whilst pressing down on the rear of the hardtop, examine the gap between the two side brackets. Determine the quantity of washers necessary to fill this gap and fit one less than this. Fit one less than this. Repeat this on the other side of the car. Keeping the rest of the hardtop centralized, tighten the hardtop side securing bolts fully. With the pressure applied downwards on the rear of the hardtop, tighten the anchor and plate securing bolts. Final check of the correct hardtop position is obtained by winding up the door windows. A gap of approximately 5/16" (8 mm) should exist between the rear vertical edge of the door windows and the quarter light channel; adjustment may be achieved by loosening the side securing bolts and moving the hardtop forward or to the rear as required. Check also that an even and adequate seal is made between the window and the hardtop rubber. Retighten the side securing bolts and carefully check the door opening and closing actions. Comments on "Hardtop Factory Fitting Instructions"
would like to see what parts fit where as it was purchased used. that I will have to make mine for the top fitting. Unfortunately, following the instructions to the letter does not assure a satisfactory installation. Moreover, the original instructions are largely unintelligible to the lay person. Pictures or a diagram is a must. This has not helped me at all. 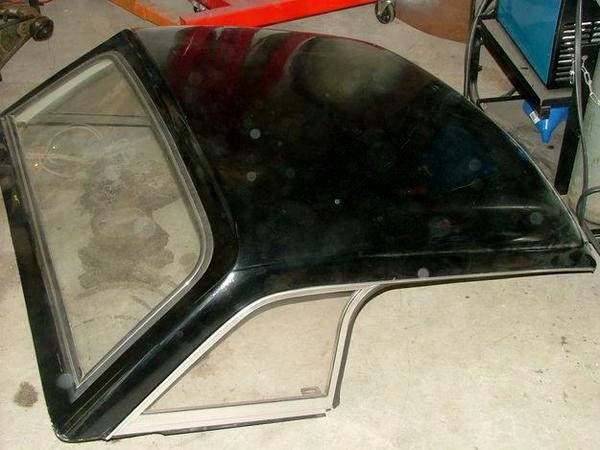 Anyone know where I can get weatherstripping for a top similar to this? My biggest need at present is the rubber above and behind the roll up windows.My top is not exactly the same, but possibly close enough that it might work. The biggest difference is where the rear of the top meets the body. This one appears to be straight accross while mine has a bit of a curve.